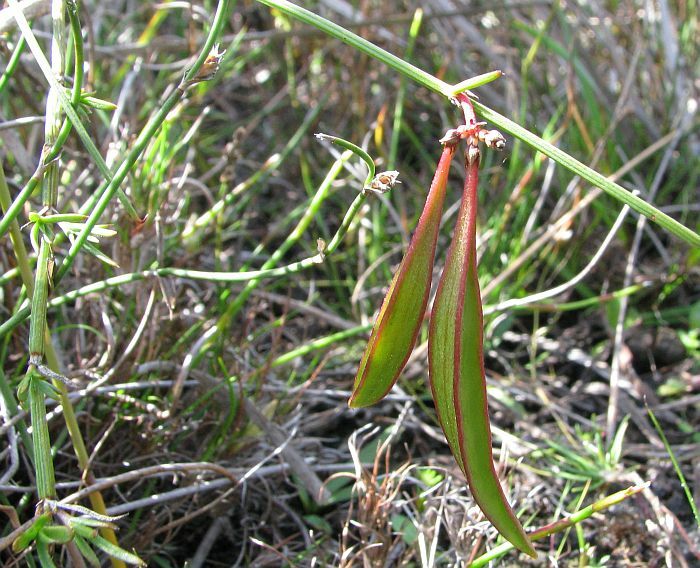 This species is a sparsely branched shrub to 45 cm (18”) in height, although often leaning on other vegetation or semi-prostrate. It is seldom common, but is widespread in coastal and near coastal (non-calcareous) sandy heath between Albany and Cape Arid (140 km or 90 miles east of Esperance), where favouring non-flooding, low-lying moist zones. 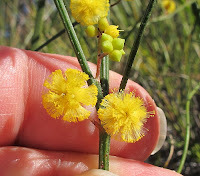 As this type of habitat is popular with many plant species Acacia aemula subsp. 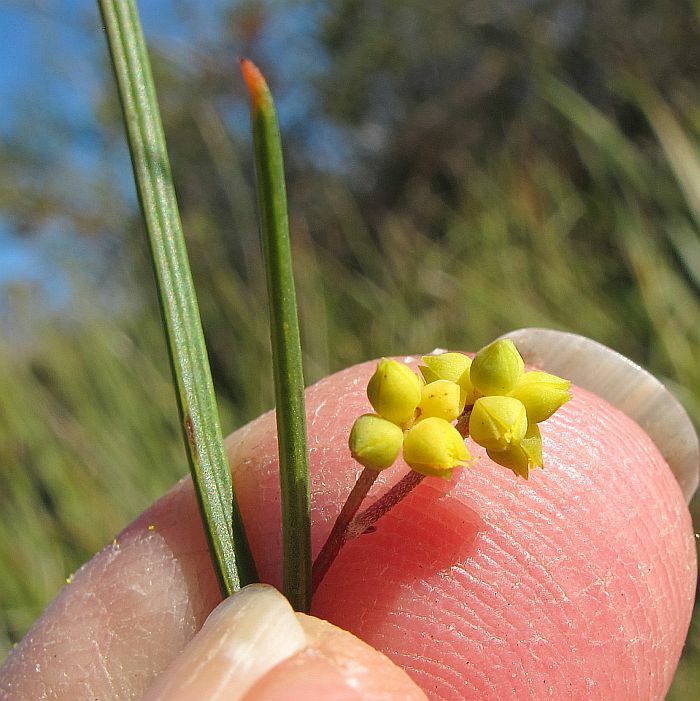 aemula can be smothered by larger species, so benefits from frequent bushfires or soil disturbance. There are 2 subspecies of Acacia aemula, with subsp. aemula being the most common, whilst the other subsp. 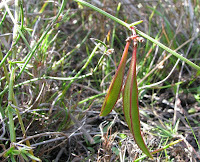 muricata is locally only recorded from Scaddan 50 km (30 miles) north of Esperance, but otherwise found between Albany and the Fitzgerald River, particularly inland. 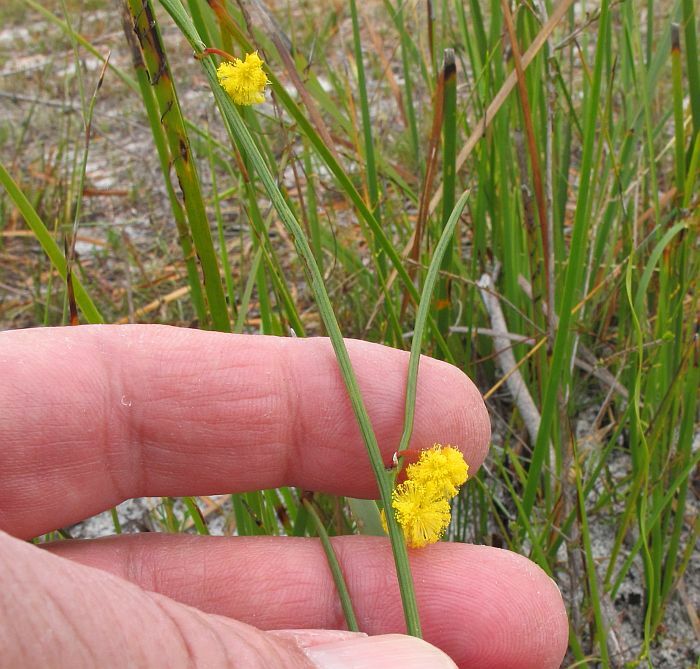 The most obvious difference between them is the color of the flowers, with subsp. aemula being golden and the other subsp. muricata, cream. 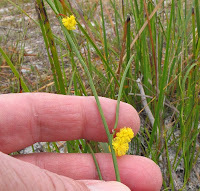 The latter is also distinguished by being muricate (having small short hard points along the stem and phyllodes (leaf-like), whilst subsp. aemula is recorded as being smooth. However, a couple of the above photos show a partial muricate structure, so there is probably a gradation between these subspecies, although extreme forms would be markedly different. Despite the shrub appearing without phyllodes, they are there, but are very similar to the stems, hence the species botanical name of Acacia aemula, with aemula meaning ‘more or less equalling’ referring to this similarity. 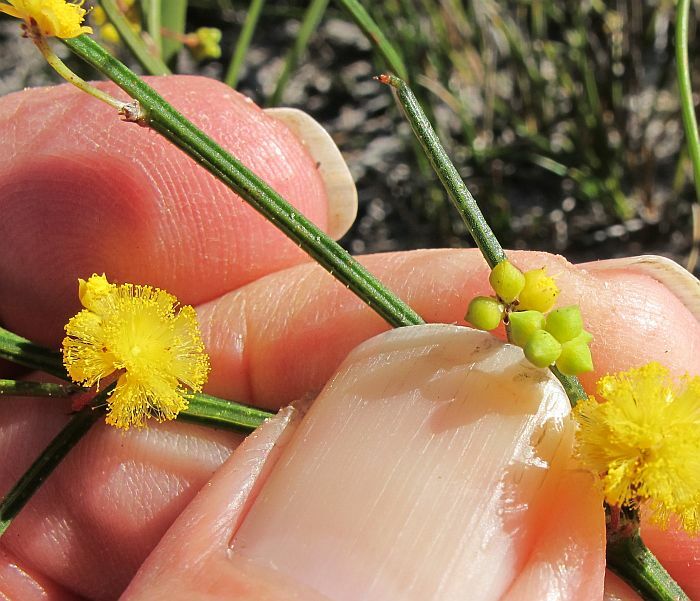 The phyllodes are the short structures below the flowers with a recurved point, plus containing fewer and less prominent ribs. 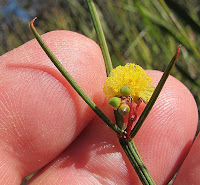 The presence of these phyllodes I might add, largely separate this species from other similar species, although these do not occur in the Esperance region. 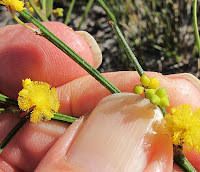 Other important features are the four sepal and petalled flowers, most acacias have five (easily seen at the bud stage), plus the unusual shaped seed pods. 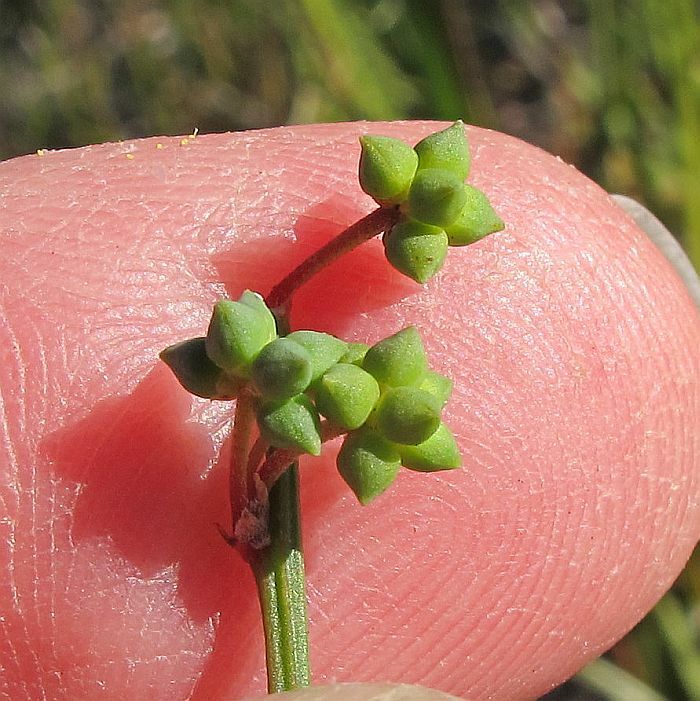 The sparse nature of this species makes it almost invisible when not in flower or without seed pods, as it blends imperceptibly with other sedge-like vegetation. 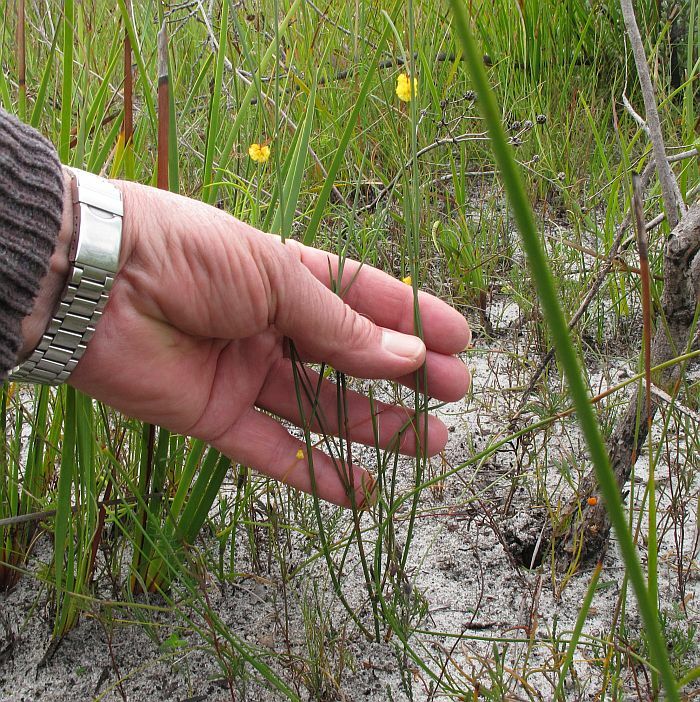 Flowering is during May and June making them then particularly noticeable, as few other species flower at this time of year. In Western Australia, the Acacia genus is now included with all other legumes in the large Fabaceae family.